7.50 points at 26 votes (rank 204). Rombach 10 1986 - "Crème de la Crème"
It is the year 2085, the earth is widely destroyed and only a few humans have survived the robot wars. The last scientists developed together a new means of transport, the so-called Tacheon, which should power a star cruiser. By this, the relativistic restriction in travels to far away star systems can be overcome. The Tacheon Drive is based on the technique, that rare ionic crystals are bombed with quartz. But the whole sources of crystals on earth were used up during the development of the prototype, so that humans are brought to the hostile second-inmost moon "IO" of Jupiter, where these can be found abundantly and are scattered over the surface. The crystals are constantly thrown out of the depth of the moon by the three active volcanoes, that had already been detected in 1980. Not long after the construction of a moon base, the first wave of aliens from Jupiter arrive, to free their moon from the human intruders. Now it is your task to protect the humans and their crystals against the murderous descendants from the Jupiter. You were equipped with the newest impulse laser backpack system, which can carry an additional man and can make itself (and its users) invisible and indesctructible for a short time. You need to bring back safely every survivor and its crystal to the "Dropzone", where the landing platform of the moon base is situated. The future of mankind depends on your success. Dropzone is a Defender clone. You have to shoot a lot of aliens and bring your own men back to the base. A difference is, that the hostile ships do not try to hijack the people spreading around, but rather drop killer androids. Furthermore there is a cloak-mode for the own man, which makes it invulnerable, as long as the energy lasts. Scrolling and animation of the own character are very fluent. The game speed is very high. The explosion of the character is virtual identical with the one in Wizball. In the lower part of the screen there is a big radar. There is no music, but very good sound effects. The collision query is unfortunately net very precise. As the most elements of the game are seemingly put into practise through signs and not sprites, some effects often overlap the enemy, so the game can get confusing. 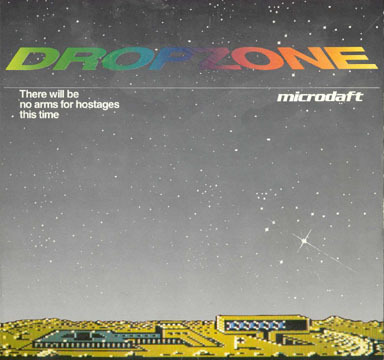 Dropzone is played with the joystick and to a small extent with the keyboard. In this game you need to acquire a feeling for your backpack, because moment of inertia and gravity have an effect on your movement. = start of the game. F1 = pause (continue with fire button). = shoot - for each upwards or downwards movement of the fire button a small laser impulse is released. The shooting direction is normally the viewing direction, but is is also posible to shoot into the opposing direction by holding the joystick into the desired direction for a short time. With this chasers can be destroyed. / = horizontal push - the longer the joystick is held into a direction the higher the speed gets. To turn around or to stop, move the joystick into the opposite direction. / = vertical push - to change the flying height push the joystick forwards or backwards. Through the gravity the flying height needs to be corrected constantly. When no horizontal push is done, you will land on the surface of the moon. Space = release strata bomb - this bomb destroys all aliens in sight except for androids. Also some trailers will be left, when a spore has been set free. Key ( F1 / Space ) = activate cloak - all keys except F1 and space activate the undestroyable shield. This can be your lifesaver. If you have a joypad, it is recommended to plug it into port 1 and put it on the floor: A doughty step on the directional pad (de)activates the cloak and a step on the fire buttons the strata bomb. Useful! The main part of the screen shows the view of the zone over which you fly in real time. Below you lies the craggy surface of the moon IO with gorges, lava-filled ditches, active volcanoes, the ionic lake and the bordering meteorite craters. In the lower part of the screen your instruments and the game status are displayed. These are: the number of people and the surface the rescued ones with the display of the direction of attack in between (an arrow that appears at the moment when an android attack starts onto a human that is still on the surface or in the moon base and which shows the shortest way), time left for the shield, available lives, strata-bombs left, points and the planet scanner in between (a radar that shows what happens elsewhere on the whole surface and strechted to six times the size of the main screen. Every member of the Dropzone crew has a certain colour and size. The landing platform is shown as a white cross). Humans: At the beginning of every attack wave the counter shows how many humans are on the surface. These move slowly to the moon base (the Dropzone) and carry ionic crystals with them. When the alien planter lower an android to destroy a human, it will whistle for help. You can rescue humans by picking them up individually and putting them down on the raised landing platform of the moon base. Planters and androids: Planters are the worst aliens. They are machines that are controlled by androids that drift over the surface and rise over volcanoes and the moon base. They are always searching for humans. When they attack, the android lowers down to the surface to chase the human. Thereby a planter transforms into a Nemesite. Nemesites: When a planter has landed, it will become a deadly aim missile that in any case will try to hit you. It escapes your pulse laser fire until it is close enough for a hit. Antimatter: When all humans on IO are destroyed, the planter and the androids melt together to a circling antimatter knot that is attracted by you. On IO an earthquake happens and the moon gets unstable. From the three volcanoes spray deadly white-glowing magma rocks. Spores: Spores are rather harmless until they are triggered. When this happens they set free 4 single trailers. Trailer: Trailers are set free by spores and are hard to handle. Some fly on unpredictable courses, other come directly towards you and persistently follow you. They are hard to destroy and need to be hit directly at the head of their body. Blunderstorms: These storms are silent but deadly appearances of IO. They hover slowly in the upper atmosphere above the planet surface and sometimes cause molecular acid rain or release strong proton flashes after a rumbling. Nmeyes: If you have survived an attack wave for too long, the aliens send as strongest weapon a Nmeye. Nmeyes watch each of your movements and sometimes flash. Their movements are irregular and they can move faster at full speed than you. They constantly release bombs on you and sequenced Nmeyes are harder to destroy. Volcanoes: Usually the three volcanoes are harmless and only shoot small magma balls onto the surface. But when all humans are lost they shoot deadly white-glowing rocks. Bombs: Planters, Nemesites, Antimatter and Nmeyes can shoot small bright bombs directly towards you. If you move with the same speed, you destroy them. You start with a group of 8 humans to be rescued, 15 seconds shield time and 3 strata-bombs. You get an extra live and a strata-bomb at every 10.000 points you reach and 7 seconds additional shiedl time for each attack wave. After you have reached one million points you won't get any further life or strata-bombs (if you are that good, you won't need them anyway...). An attack wave is ended by destroying all Planters, Spores, Trailers and Blunderstroms and by bringing all humans back to the moon base. You get a point bonus at the end of each attack wave for the number of rescued humans multiplied by the number of attack waves, but a maximum of 500 points per man. In every fifth wave there comes a new shipment of humans. But before this round you need to fight yourself through an Trailer invasion wave. The game as attack waves that are numbered from 1 to 99. After 99 attack waves you need to repeat the waves 95 to 99. Every wave is totally random in plot and point of start. If you lose a life whil carrying a human, it will be replaced on the surface. If you save all eight humans and land, no further android attacks will happen during the current attack wave. But if you have saved less than eight an android will infiltrate the moon base by landing on the platform and walking into the base. 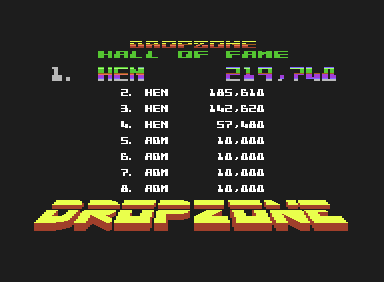 If you have reached an sufficient high number of points after your mission, you are asked to enter the abbreviation of your name (three characters) into the Dropzone Hall of Fame (highscore list). With this you are one of the eight most important heroes. To choose the character move the joystick to the left or the right, to enter the characters press the fire button. For this you have 60 seconds. The list will be saved on disk in the version by "Remember" (but not in the original version). In dependece of your performance you will get one of ten ranks. A beginner that has not reached the 10.000 points gets no rank. With an average number of points you will be "moon cadet". But for the mission to be a full success you need to reach the rank "Megastar". This rank is only assigned when 1.000.000 or more points are reached. There are different strategies. Either you wait for androids that fall to the surface and destroy them to collect points, or you rescue all humans as fast as possible. But keep in mind that Nmies are sent out if you take too long. The strategy partly depends on how far from the moon base your men are at the beginning of an attack wave. The distance is different for every wave (except the first one). Don't give too much push, it lowers the reaction time for incoming aliens. It is better to clear a screen and then start into the next section. Listen for the help wistles. When you hear them watch the direction indicator and the scanner to find the problematic area. Use your shield if there are aliens in the target area. In the moment when a Nemesit enters the main security area there will be a warning sound. Then you will be attacked. To destroy it you need a bit experience to "circle it out of the area". Then you turn around and fire exactly on the spot when you are at the same height with it. Using the shield will help in many situations as when picking up a human shortly before he gets destroyed by an android, or when loading people while you are attacked by a Nmie. Trailers have own "personalities". Once you know them you can deal quickly with the Trailer invasions. Here also the shield is useful. Alsways keep an eye on the Blunderstorms. Before they release themselves they rumble about one second, so you have the possibility to make off. If you lose a life by crashing into a magma lump, you will newly materialize over the same area. You should then change your position quickly as otherwise there is the danger of losing another life. If you use too many strata-bombs in rapid succession, the aliens will send Nmies in retaliation. The version by "Remember" offers next to the different cheat options also the manual and a highscore list that is saved on disk. 1570: "Not very easy, but a nice shooter for in between. Probably was a real smash at that time ;-)." 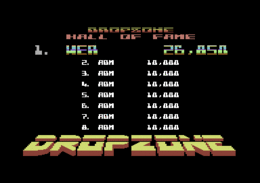 Robotron2084: "Dropzone is the very first choice, if you want to play a Defender lookalike on the C64. Even "Guardian", which comes closest to the actual Defender, pales in comparison to Dropzone's absolute perfection. Unbelievable performance and one of my very very big recommendations for shooting smashing friends. 9.5 out of 10 points. WOW!!!" H.T.W: "An extremely fast, rather difficult shooter with a slight strategic approach which probably drives you mad at the beginning. But after you have got used to the insane speed and the partially crazy course of movements of the enemies after some time, you survive the first waves and you can even make it to enter the highscore. The 219.740 points from Robotron 2084 are probably head and shoulders of the rest, for me there is absolutely not more to reach than 30.000 points. This page was last modified on 26 October 2018, at 03:06. This page has been accessed 16,453 times.